← What kind of name is Cow Tales? 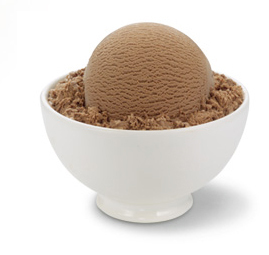 The words “Chocolate ice cream”, and “happy” are pretty much equal to me. The title of this post could read Happy happy day! I don’t know who decided that this day was dedicated to this flavor, but my hat is off to them. My favorite, chocolate ice cream is Haagen Daz. It has pure flavor, no artificial tinge and is really creamy. Its ingredients are simple: Cream, Skim Milk, Sugar, Egg Yolks, Cocoa Processed with Alkali. Sure it packs a whopping amount of fat per serving, but relax, it has 5g of protein, 8% of your iron RDA, and 10% of calcium and vitamin A. So enjoy a bowl tonight, and skip the guilt. Posted in All Things Chocolate, Ice Cream. Bookmark the permalink.